For those of you who think about touring California (or any other) wine countries, but find the task too daunting, here is some advice: take it slow, you'll never get all of California done in a week but you can get a good overview of a region or two if you take it in bite-sized chunks. In early September I visited California for two reasons: wine and jazz. I was to attend the 56th Annual Monterey Jazz Festival, but could not be in the Capital of North American wine without stopping by and tasting as many wines as possible. That led me to renting a car in Monterey and making the short drive to Carmel-by-the-Sea and the Carmel Valley to visit a number of tasting rooms and sip on some realy marvellous wines. The best part about winery touring are the wines - tasting things one has never tasted before and probably won't be able to get at home. The worst part of winery touring outside your own country is the limit on the amount you are allowed to bring back (in Canada anyway). Also, here's some more advice: don't try the wines you can get at home, instead, go for the wineries you have never heard of or wines you have never tasted, your everyday favourites will be there when you return. ON the first day, we set our sights on the wineries around the tasting rooms of Carmel and in the Carmel Valley, getting in touch with the Monterey County Vintners and Growers Association for the lay of the land. We drove into Carmel-by-the-Sea, home to at least five winery tasting rooms. Unlike back home where the winery’s store has to be attached to their actual winery, here in California you can have a completely separate store not tied to your winery - in a completely different town or in a shopping mall even. 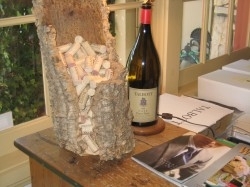 The tasting rooms recommended were Galante, Caracciolo Cellars, Figge Cellars, Cima Collina , and Wrath. Beware, however, because each tasting room does not open until about 1 or 2 in afternoon. Seeing as we arrived at 10am, we had to make some alternative plans, and so we climbed back into the car and pointed the GPS to an address I had been given: 8940 Carmel Valley Road – Chateau Julien. The Chateau was started 30 years ago, with 16 total acreage, of which 5.5 are planted, with now, 19- year-old Sangiovese vines. I found this a peculiar part of this winery, Merlot is their flagship wine, which parallels the St. Julien region of France, which they patterned the wines and name after, yet they only grow Sangiovese on the property. Chateau Julian was the second winery established in the Carmel Valley. This particular locale had the winery experience down to a tee, unfortunately I found the wines to be lacking in any complexity or interest. Each day they select 5-7 wines for the public to taste and that is what you can choose from: you can choose to taste the whole selection or a part. We went through the line-up, from Chardonnay, Syrah, Merlot, but skipped the sweeties - it was just too early in the day for that. The two wines that did stand out were their 2008 Estate Sangiovese ($25.00) which had a pretty cherry nose along with sour cherry and good acidity on the palate, and seemed to be a good food friendly offering (*** ½+). Their best wine was a 2007 La Conviviance ($55.00) red blend. La Conviviance loosely translates to “living the good life” and it's a blend of Merlot (52.4%), Malbec (39.2%) and Cabernet Sauvignon (8.4%), with black cherry and chocolate on the nose that comes across as chocolate and blackberry in the mouth, nice weight and good balancing acidity (****) – which seemed to be the trademark of this winery, good acidity, even in the wines we were not partial to (because they seemed to have too much of the good stuff). Moving on (about 16km) we came upon Carmel Valley Village, this is a very lively place which rests on the way down to Arroyo Seco. 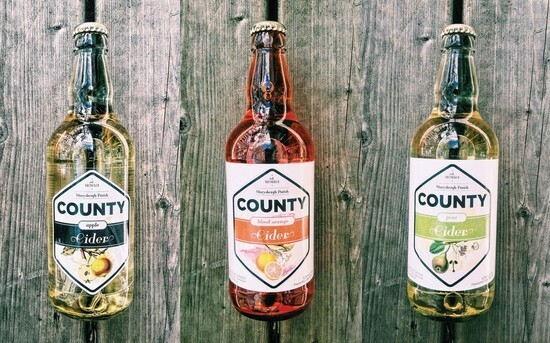 Restaurants, shops and lots of winery tasting room, can all be found within a mile: it's a walkers paradise! Here we found Joullian Vineyard and were lucky enough to find a wine jocket (person pouring wine behind the counter) who knew her way around the area as well as the wines she was pouring. 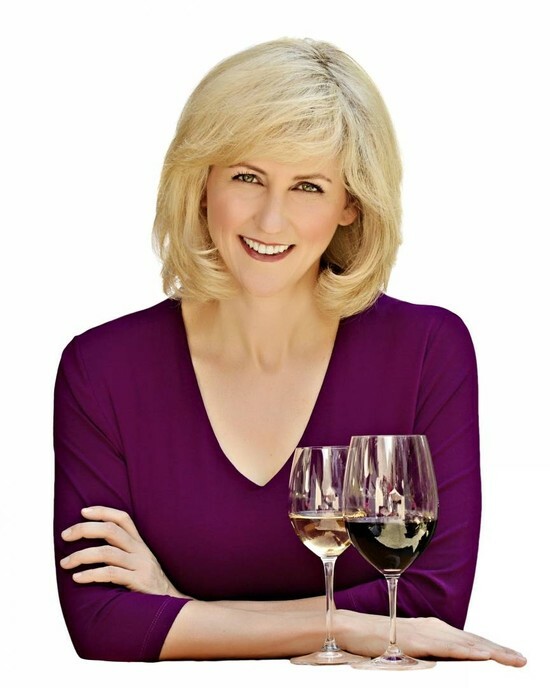 She knew where everyone was, what they made and what their best wines were; when you're wine touring, people like this are invaluable resources because you don't want to waste what limited time you have on wineries not pouring what you like. 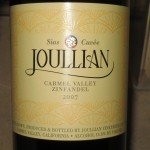 Joullian is a winery established in 1982 and has the distinction, in my mind anyway, of having the first estate grown Zinfandel in the Carmel Valley, though interestingly enough their property is too hot to grow Chardonnay (a staple grape in Monterey), so it is the only grape they buy from growers. We found some really good wines here. Best wine: 2009 Sleepy Hollow Chardonnay ($33.00), the fruit is purchased from Talbott (our next stop); this wine was really nice and on the buttery side but with a sweet smoothness on the palate with hints of vanilla and sweet fruit and a deliciously long finish. (**** ½). Most interesting wine: The Retro Rouge, a non-vintage blend that makes use of every grape grown on the property in a field blend, 10 in total including some black muscat and “alicane bouschet” (a Portuguese variety). From Joullian we went down the road about 200 yards to the Talbott Vineyards tasting room. Talbott was also established in 1982 and they own the famous Sleepy Hollow vineyard, 565 acres, planted in 1972 to mostly Chardonnay and Pinot Noir. Here we tasted through a pair of both Chardonnays and Pinot Noirs, though the winery makes many more; but too much of a good thing can be seen as gluttony. We were also offered a reserve from each of the varietal and those really were some spectacular wines, so I am glad we acquiesced. Best Chardonnay: 2009 Cuvee Carlotta Chardonnay ($52.00) a ten best barrel blend with all fruit coming from the Sleepy Hollow vineyard, only 250 cases produced and matured in all new French oak for one year; the wine is named after the grandmother of the owner – the wine is super rich, super buttery and super smooth (**** ½). Best Pinot Noir: 2009 Sleepy Hollow Pinot Noir ($40.00), the Sleepy Hollow vines are the oldest owned by the winery at 35 years, the wine is aged 12 months in 30% new oak, all French. The nose is delicate black cherry, sour cherry with subtle spice; while the palate is juicy with sweet cherry, hints of spice and pepper, the long red fruit finish with a dusting of tannins and fruit that lingers with a strawberry sensation on the tongue. (**** ½+) As you can see by the list below we were talked into a few more wines then the four we originally intended. 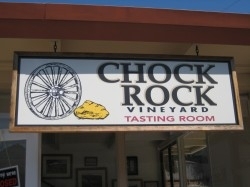 Part one of the Carmel tour ends with a quick trip over to Chock Rock Vineyard. Chock Rock is the project of winemaker Dan Karlsen, winemaker for Talbott (see above), here he specializes in Chardonnay, Pinot Noir and Syrah. Having just poured over a lot of his Chardonnay and Pinot work I wanted to see how he was doing with Syrah. Dan has an interesting wine philosophy that is written on his back label: “Wine Makers don’t make anything of interest – They just keep it from rolling downhill”. We were served, in the tasting room, by his wife Kathleen (and partner in this winery project), she poured for us the two Syrahs on offer: the 2007 Arroyo Seco and the 2006 Chalone, both a very reasonable $18.00. The Arroyo Seco is full of sweet raspberry and plum fruit on the nose, almost port-like in intensity of aroma and flavour, rich, ripe and slightly peppery (*** ½). The Chalone was the more toned down of the two showing some real finesse to Syrah making. Earthy, smoked meat, pepper, strawberry, smoky and cherry (especially on the nose); a nice medium length finish that offered up sweet peppery notes … very classic Syrah qualities (****+). 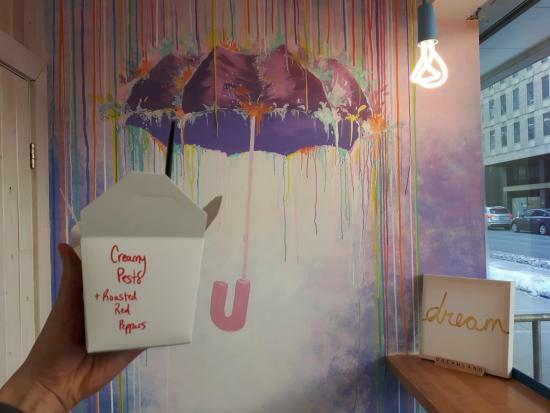 In May of last year, sisters Coco and Marlo De Leo opened the DreamLand Cafe, a fresh pasta joint located on Laurier Avenue that has since become a local breakfast and lunch spot favourite.